un savādāks veids kā veidot burbuļus. 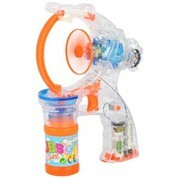 Bubble gun with music and colour lights, what makes playing more attractive especially in evening. Gun on you must push button on handle. mixing washing-up liquid with water).